Welcome to the Journal of Neurological Surgery! You are holding the first issue of the Journal of Neurological Surgery in your hands. Although new, this journal already has a long history. This journal has emerged from the integration of three existing, complementary, journals: Central European Neurosurgery/Zentralblatt für Neurochirurgie, Minimally Invasive Neurosurgery, and Skull Base. It is worthwhile to take a moment to consider the scope and expertise that these journals have established, and which they bring to our new publication. Central European Neurosurgery/Zentrablatt für Neurochirurgie is one of the oldest neurosurgical journals in existence. It first appeared in 1936, and has published continuously since then. A general neurosurgery journal serving German-speaking neurosurgeons for decades, it has long embraced the English-language speaking branches of the specialty. Moving gradually from dual language abstracts to a full English-language publication, the journal has expanded its readership throughout Europe and the rest of the world. Minimally Invasive Neurosurgery was founded by Professor Axel Perneczky in 1993. 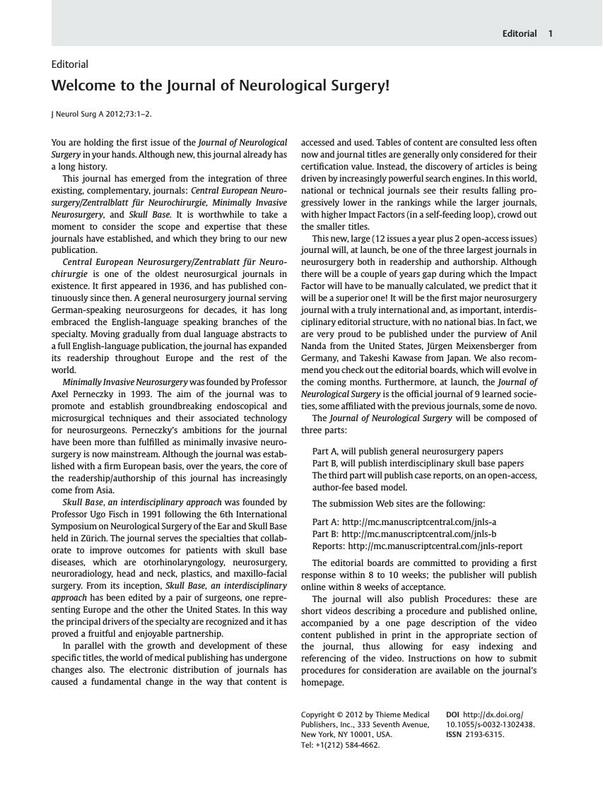 The aim of the journal was to promote and establish groundbreaking endoscopical and microsurgical techniques and their associated technology for neurosurgeons. Perneczky's ambitions for the journal have been more than fulfilled as minimally invasive neurosurgery is now mainstream. Although the journal was established with a firm European basis, over the years, the core of the readership/authorship of this journal has increasingly come from Asia. Skull Base, an interdisciplinary approach was founded by Professor Ugo Fisch in 1991 following the 6th International Symposium on Neurological Surgery of the Ear and Skull Base held in Zürich. The journal serves the specialties that collaborate to improve outcomes for patients with skull base diseases, which are otorhinolaryngology, neurosurgery, neuroradiology, head and neck, plastics, and maxillo-facial surgery. From its inception, Skull Base, an interdisciplinary approach has been edited by a pair of surgeons, one representing Europe and the other the United States. In this way the principal drivers of the specialty are recognized and it has proved a fruitful and enjoyable partnership. In parallel with the growth and development of these specific titles, the world of medical publishing has undergone changes also. The electronic distribution of journals has caused a fundamental change in the way that content is accessed and used. Tables of content are consulted less often now and journal titles are generally only considered for their certification value. Instead, the discovery of articles is being driven by increasingly powerful search engines. In this world, national or technical journals see their results falling progressively lower in the rankings while the larger journals, with higher Impact Factors (in a self-feeding loop), crowd out the smaller titles. This new, large (12 issues a year plus 2 open-access issues) journal will, at launch, be one of the three largest journals in neurosurgery both in readership and authorship. Although there will be a couple of years gap during which the Impact Factor will have to be manually calculated, we predict that it will be a superior one! It will be the first major neurosurgery journal with a truly international and, as important, interdisciplinary editorial structure, with no national bias. In fact, we are very proud to be published under the purview of Anil Nanda from the United States, Jürgen Meixensberger from Germany, and Takeshi Kawase from Japan. We also recommend you check out the editorial boards, which will evolve in the coming months. Furthermore, at launch, the Journal of Neurological Surgery is the official journal of 9 learned societies, some affiliated with the previous journals, some de novo. The third part will publish case reports, on an open-access, author-fee based model. The editorial boards are committed to providing a first response within 8 to 10 weeks; the publisher will publish online within 8 weeks of acceptance. The journal will also publish Procedures: these are short videos describing a procedure and published online, accompanied by a one page description of the video content published in print in the appropriate section of the journal, thus allowing for easy indexing and referencing of the video. Instructions on how to submit procedures for consideration are available on the journal's homepage. There are many more exciting developments to come, so watch this space. For the time being we hope you will enjoy this first issue of the Journal of Neurological Surgery. The next issue will reach you in less than a month. Best wishes for this New Year … and good reading!